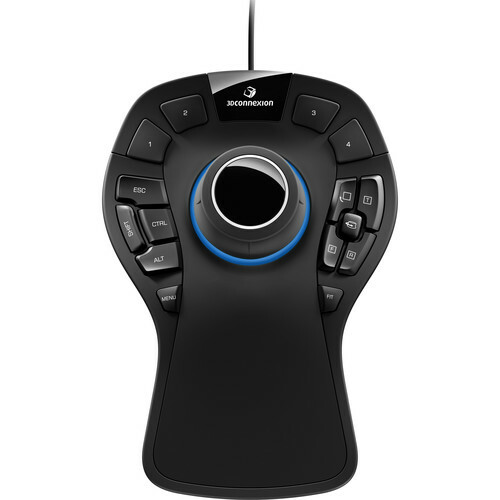 The SpaceMouse Pro 3D Mouse from 3DConnexion is a professional 3D mouse that offers a compact controller cap with 6-Degrees-of-Freedom sensor technology to afford X, Y and Z axis control and 15 fully programmable function keys. It supports over 130 applications including but not limited to: Inventor, SolidWorks, CATIA V5/V6, Pro/Engineer, NX, Solid Edge, 3ds Max, and AutoCAD. In addition to high performance, the SpaceMouse Pro is built with ergonomics in mind. The hand rest is full-size and has a soft coating for superior comfort. It positions your hand perfectly for the controller cap. Each of the 15 tactile, fully programmable buttons are in a convenient position, and let you access frequently used commands. This all can translate to an efficient workflow. Conveniences include four Intelligent Function keys, easy-access keyboard modifiers, and an on-screen display and Virtual NumPad for Windows. This wired mouse plugs directly into the USB port on your computer. Box Dimensions (LxWxH) 10.1 x 7.3 x 3.7"
SpaceMouse Pro 3D Mouse is rated 4.8 out of 5 by 6. Rated 5 out of 5 by Marius from must have if you make 3d in sketch up I use it mostly in sketch up pro & it's really worth of the high price if you make 3d as a pro. Previously I had some problems with my regular 5 button mouse during zooming & the work was not so smooth like now. I tried it also with autocad 2009 for 2d purposes & it works very good, as well. I tested the stuff with google earth, but I wasn't impressed. Anyway it's pricey product so I recommend to buy it only for business. Rated 5 out of 5 by Krauti from Great 3D mouse-will be buying more Mind you this is a product for 3D CAD work or similar, so for normal computer use you won't need it much.I like the simplicty of it. It's heavy enough to not move about, comfortable for my hand to rest on it and everything I personally need is there. I've used the more pricey SpacePilot Pro as well but never used the added functions on it and to me it wasn't worth the extra $ or so.Really no negative feedback here. I use it every day when working with Unigraphics and recommend it. Rated 5 out of 5 by Capt Mark from Once you have one, you will smile. Cahnges the way you move the models, increases speed and accuracy. A must in the modeling world. Rated 5 out of 5 by tleible from More bang for the buck Very helpful tool, all the functions accessible with one hand. Rated 4 out of 5 by AlexChe from very interesting gadget. Need the time to feel comfortable to operate it. Like a toy.